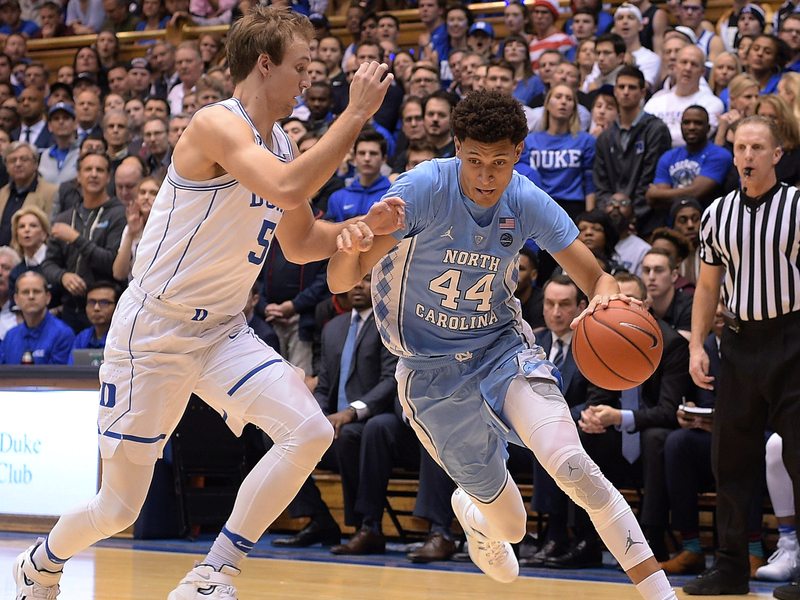 The Player of the Year race in the ACC is closer and more contentious than the contest in any other power conference this season, and the proceedings at the Smith Center offer Duke's Luke Kennard and UNC's Justin Jackson one last chance at a distinctive statement effort. DURHAM, N.C – In the order of questions asked Friday afternoon, Mike Krzyzewski lavished unmitigated praise on Luke Kennard, Justin Jackson and the general depth of talent across every ACC roster. The Duke coach declared Kennard, the Blue Devils’ most valuable and most reliable asset, to be one of the best players in the country. A few minutes later, he said Jackson, the sinewy leading scorer for rival North Carolina, was also one of the best players in America. And then Krzyzewski noted that while the Tar Heels’ most potent weapon is difficult to contend with, so, too, are a lot of others in the ACC, because those others have the talent to leave the ACC sooner than later. Provincial propaganda or not, it underscored one of several intriguing dynamics at play when Duke and North Carolina meet in the regular season finale on Saturday night: The Player of the Year race in the ACC is closer and more contentious than the contest in any other power conference this season, and the proceedings at the Smith Center offer Kennard and Jackson one last chance at a distinctive statement effort. For a pair of 2016-17’s ascendant stars, it represents one final opportunity to create separation where there is not much at all. This isn’t the case everywhere. Cue the howling, but realistically, we can assume mystery will not shroud the Player of the Year tabulations in the Big East (Villanova’s Josh Hart), the Big Ten (Purdue’s Caleb Swanigan), the Big 12 (Kansas’ Frank Mason), the Pac-12 (UCLA’s Lonzo Ball) and probably even the AAC (SMU’s Semi Ojeleye). The nation’s best basketball conference offers no such clarity. Jackson and Kennard enter a rivalry game on the final weekend as frontrunners with high-efficiency numbers that are eerily similar, and thus make for legitimate arguments either way. The season totals for the 6’ 8” Jackson: 23.4 points and 6.0 rebounds per 40 minutes. Effective field goal percentage: .549. Total points produced: 507. Assist rate: 14.6%. Usage rate: 25.5%. Turnover rate: 9.4%. Win Shares: 5.0. “He’s done some big-time things for us,” Tar Heels coach Roy Williams said. The season totals for the 6’ 6” Kennard: 22.4 points and 5.9 rebounds per 40 minutes. Effective field goal percentage: .598. Total points produced: 548. Assist rate: 14.1%. Usage rate: 23.9%. Turnover rate: 9.6%. Win Shares: 6.2. “He’s been consistently excellent,” Krzyzewski said. The value of both players is not in dispute. In searching for the most fractional differences between them, Kennard has been the steadying force for a Duke squad beset by injuries and controversies, with a Win Shares total that ranks fourth in the country as of Friday reflecting that contribution. Yet even this infinitesimal gap shrinks when we consider ACC play, and especially performances against the more competitive teams in a blisteringly tough league. Kennard’s numbers in ACC games overall: 22.1 points and 5.4 rebounds per 40 minutes with 2.8 Win Shares. Jackson’s numbers in conference outings: 23.5 points and 5.8 rebounds per 40 minutes, with 2.3 Win Shares. If Kennard might warrant a bonus for carrying Duke through a tumultuous season, any discussion framed by ACC play must acknowledge that North Carolina took a two-game lead over its rivals into the season finale. To somewhat offset the natural schedule imbalance in a, well, imbalanced 15-team league, we examined how both players have fared against teams sporting a winning ACC record as of Friday morning. It got even more baffling. And spooky. Kennard (nine such games): 19.2 points, 5.4 rebounds, 44% shooting overall and 41.9% shooting from three-point range. Jackson (eight such games): 19.0 points, 4.4 rebounds, 44.9% shooting overall and 38.5% shooting from three-point range. This is an insanely thin margin. Which brings us back to Saturday night and a last chance to make another good impression. It will not be a direct, possession-by-possession duel. If Jackson and Kennard are matched up in the half-court, it’ll be only through the caprices of transition basketball; both sides have much better options for defensive stoppers and will deploy them accordingly. And predictably, the two people who care the least are the ones at the center of the deliberation. “That stuff doesn’t mean much to me,” Kennard said this week, embarking on a short a tangent about individual achievement between sips from his morning cup of chocolate milk. “I try to focus on right now. It’s all about moments.” A day later, in a room just steps from the Smith Center floor where closing arguments will be made Saturday, Jackson begrudgingly acknowledged his position in the Player of the Year race but also noted that he has removed his Twitter app from his phone—the better to insulate himself against thinking about anything like that at all. The end of the conversation will be part of the fun during a (sort of) head-to-head matchup Saturday. And, anyway, we don’t have much else to go on to this point. In the teams’ first meeting, a Feb. 9 clash won by Duke, Luke Kennard and Justin Jackson each logged 36 minutes. They both hit eight shots. Kennard finished with 20 points that night. Jackson scored 21. No, there isn’t much separating the ACC’s top two stars at all. Just a little room for debate.